Flash Seems To Be Coming To The iPhone. But Is That A Good Thing? When the iPhone was first released, there was an abundance of speculation over whether the phone’s lack of Flash support would cripple its browser and give us something less than “the real web” that Apple had promised. 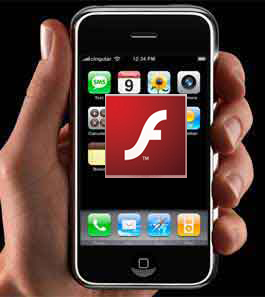 At the time, Steve Jobs explained that the full version of Flash wouldn’t run well on the iPhone (the iPhone runs on an ARM11 chip, which doesn’t play nice with Flash), but that Adobe’s Mobile Flash was lacking in functionality – he wanted a product in the middle before Apple would consider putting Flash on the iPhone. Betlem’s insistence that the iPhone is a closed platform is meant to infer that Adobe isn’t ultimately in control of whether or not Flash will ever make an apperance. This may be strictly true, but it’s unlikely that Adobe would begin work on the iPhone plugin in the first place if it didn’t have a reasonable expectation that Apple would include it, once it met Jobs’ expectations. So it sounds like Flash is on the way. But do we really want it? These days, most of us use Flash primarily to view videos on sites like Hulu, YouTube, and CNN. Flash on the iPhone may give us access to all of these sites (assuming its CPU can handle video), but I’d rather see native applications for each of these media hubs similar to what YouTube has created. Flash is notoriously CPU-intensive, which is the last thing the iPhone needs with its already lackluster battery life – native apps would allow for H.264 video playback on the phone’s Quicktime player that would probably require only a fraction of the CPU cycles. Other issues with Flash crop up on more standard websites. Flash-based sites can be fun and innovative, but they also tend to be inefficient and unnecessarily difficult to navigate (see the Chipotle homepage for a good example). Finally, there’s the concern over Flash-based advertisements, which can be incredibly intrusive. These issues aside, Flash still plays an integral role on the web, and there’s nothing more frustrating than getting denied trying to watch a Flash-only video clip. Apple should include Flash if only for completeness’ sake, while trying to give web developers an incentive to use it sparingly on their mobile sites.